This Sunday we come to the conclusion of our five-week meditation on the Eucharist. In last week's Gospel, Jesus was quite clear and quite literal that we are called to "eat the flesh of the Son of Man and drink his blood." This was very hard for his followers to accept. In this Sunday's readings, we learn - It's decision time! We are called to make (or recommit to) a choice, just as the early Israelites were in our first reading and the apostles were asked in today's Gospel. In our first reading (Joshua 24:1-2, 15-18), Joshua assembled the Israelites as his life on earth was coming to an end. As they were now well established in their promised land, Joshua sought to renew the covenant their ancestors made at Sainai. "Decide today, whom you will serve!" Joshua gathered together all the tribes of Israel at Shechem, summoning their elders, their leaders, their judges, and their officers. When they stood in ranks before God, Joshua addressed all the people: "If it does not please you to serve the LORD, decide today whom you will serve, the gods your fathers served beyond the River or the gods of the Amorites in whose country you are now dwelling. 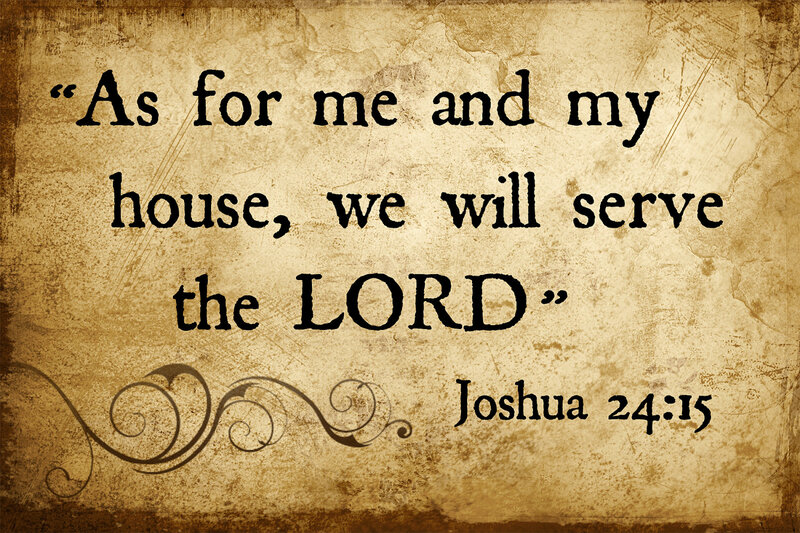 As for me and my household, we will serve the LORD." But the people answered, "Far be it from us to forsake the LORD for the service of other gods. For it was the LORD, our God, who brought us and our fathers up out of the land of Egypt, out of a state of slavery. He performed those great miracles before our very eyes and protected us along our entire journey and among the peoples through whom we passed. Therefore we also will serve the LORD, for he is our God." In our Gospel reading (John 6: 60-69), we hear the conclusion of Jesus' Bread of Life Discourse. His disciples found it hard to accept Jesus' command to eat his very flesh and drink his very blood. Many of them left and returned to their former way of life. Jesus asked the twelve, "Do you also want to leave?" Imagine being there in that moment. Many of Jesus' disciples who were listening said, "This saying is hard; who can accept it?" Since Jesus knew that his disciples were murmuring about this, he said to them, "Does this shock you? What if you were to see the Son of Man ascending to where he was before? It is the spirit that gives life, while the flesh is of no avail. The words I have spoken to you are Spirit and life. But there are some of you who do not believe." Jesus knew from the beginning the ones who would not believe and the one who would betray him. And he said, "For this reason I have told you that no one can come to me unless it is granted him by my Father." In our Epistle reading (Ephesians 5:21-32), St. Paul is always teaching us how we should live as Christians. Today's passage is often interpreted without considering to whom it was written or the time and culture in which it was written. The central theme is that the marriage bond is akin to Christ's intimate, loving relationship with his Church. We are called to "be subordinate to one another out of reverence for Christ"; to love each other as Christ has loved us. "Decide today whom you will serve"; "Do you also want to leave?" It might be helpful, sometimes, to sit down and consider the consequences of these decisions. What happens if I choose A; what happens if I choose B. For the apostles, it was a no-brainer. They had already come to believe, "Master to whom shall we go, you have the words of eternal life." Just like the apostles in today's Gospel, we are asked the question, Do we believe Jesus or not? If we do, we know what we must do.